Visual Arts students at The Sixth Form College, Solihull have been taking inspiration from the professionals with a visit to museums in London this month. Year 12 and Year 13 students from our A level Fine Art and Photography courses, were joined by students from the BTEC Art & Design course. They visited the National History Museum and the Victoria & Albert Museum. 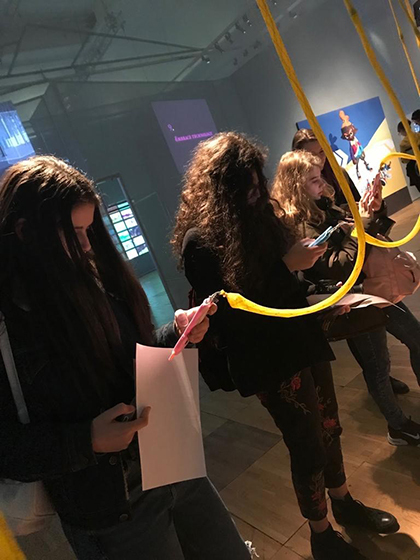 At the former, they visited the Wildlife Photographer of the Year exhibition, while at the Victoria & Albert Museum they enjoyed the Video Games: Design/Play/Disrupt exhibition and the Fashioned by Nature exhibition. The Victoria and Albert Museum is the world’s largest museum of decorative arts and design, with a collection of more than two million objects, spanning 5,000 years of art. Exhibits include the world’s largest collection of post-classical sculpture, as well as departments for South Asian, Chinese, Japanese, Korean and the Islamic art. Meanwhile, the National History Museum, while better known for its exhibits on the natural world, gave students a unique opportunity to take in some award-winning photography.